(Stone Mountain, GA) — Healthcare Dynamics is assisting Friends of Disabled Adults and Children (FODAC) by providing 70 wheelchairs to people displaced from their home and medical equipment by Hurricane Ike. Other wheelchairs are helping to reduce the waiting lists in Georgia. Thousands of people have been helped by here in Georgia and across the U.S. by FODAC, ranging in age from 18 months to 104 years. Over the past 22 years, more than 19,000 wheelchairs and 5.500 hospital beds have been distributed by FODAC. The retail value of the equipment distributed by FODAC last year is over $8.2 million. 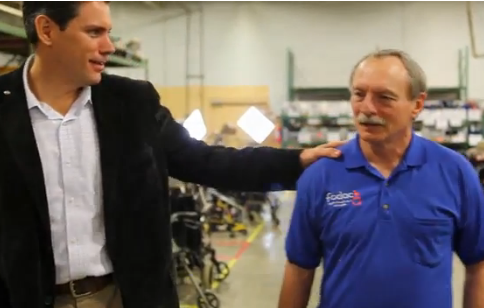 FODAC’s wheelchairs are rolling in 41 states and 63 countries. FODAC’s “Ramps for Champs” program builds ramps and makes home modifications for people with disabilities. FODAC also adapts vehicles for people with disabilities and operates a mostly volunteer run Thrift Store which provides important operating funds for the organization. FODAC is a tax-exempt, 501( c ) ( 3 ) nonprofit organization. If your church or company would like to hold a wheelchair and home care equipment drive, call Christy Clark at 770-491-9014.